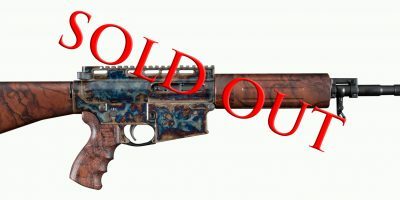 This is a gallery of what work we have done and guns we have sold in the past. THESE GUNS ARE NOT FOR SALE. If you are interested in any of these guns and want more information, or to see if we have something similar in stock, please call 585-657-6338. “Every man owes a portion of his time & his income to the business or industry in which he earns a Living”. His legendary exploits with a Winchester rifle are well documented and his trips to Africa are still talked about today. TR was also one of this country’s most visionary presidents, his foresight in preserving this country’s natural resources allows all of us the opportunity to enjoy them today. 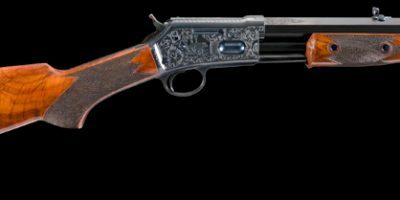 Just like TR’s preservation of our natural resources, Turnbull Restoration & Manufacturing Co. is working hard to insure that the firearms that helped build this great country can, and will be enjoyed by future generations. Grips: One piece ivory with carved “TR” monogram on right grip & carved buffalo on left grip. 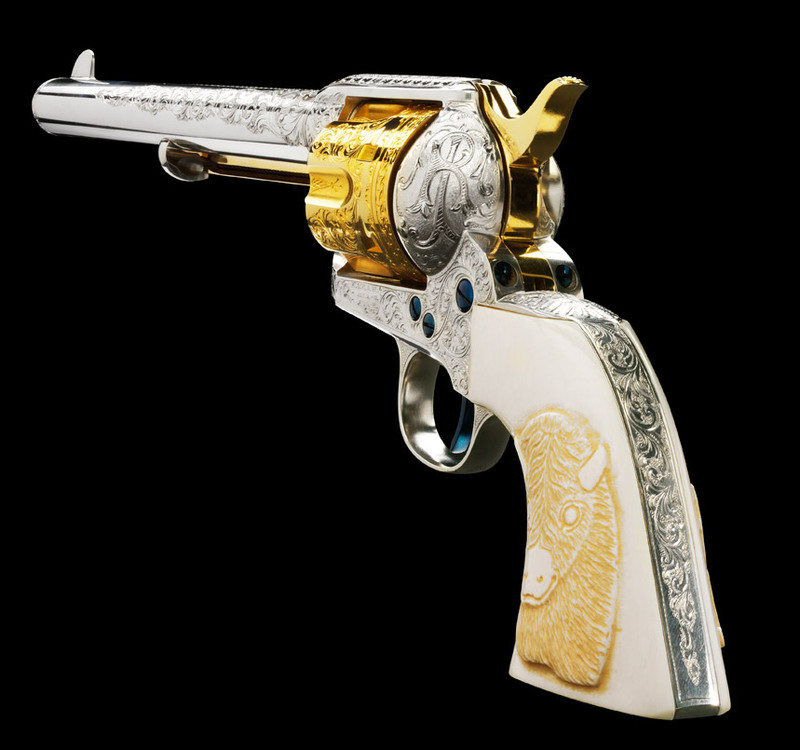 Engraving: Nimschke style pattern of original gun. Engraved by John Adams & Son. Metal Finishes: Gold plated hammer, cylinder & ejector rod housing; balance of gun in silver plate. 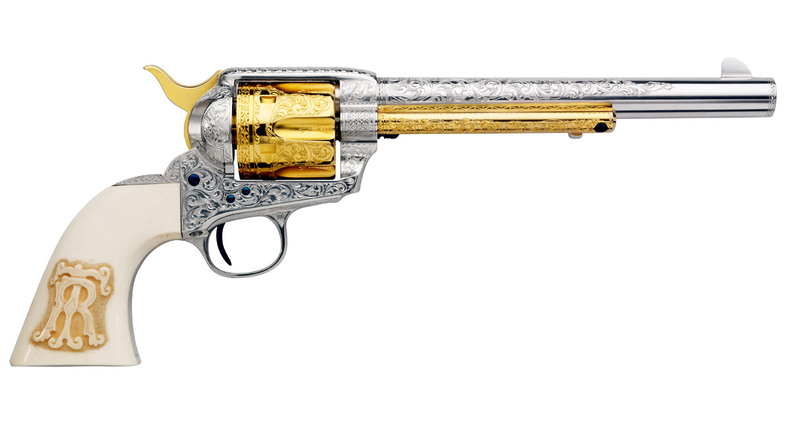 With the start of our Theodore Roosevelt Colt project, Turnbull Restoration & Manufacturing Co. will be re-creating one of the most famous Colt revolvers ever made. The production and subsequent sale of these guns, will allow Turnbull Restoration & Manufacturing Co. to continue our support of The National Firearms Museum. 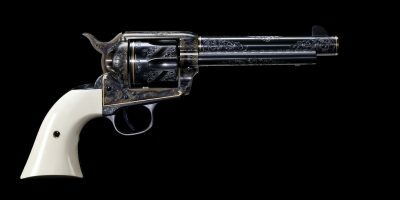 The museums efforts to preserve and protect this country’s firearms heritage is very important so that these pieces of history do not disappear. 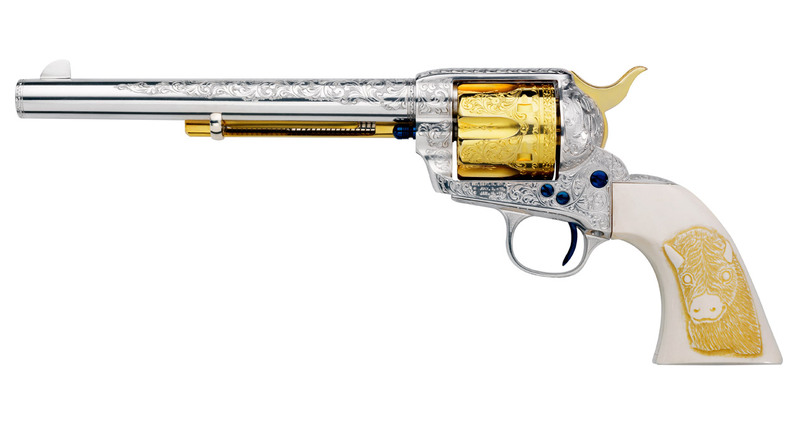 Special serial numbers TR01 – TR25 from Colt factory. Turnbull Restoration & Manufacturing Co. will be carefully detailing the metal polish to duplicate the original gun. *Each gun will come in a French style fitted case with the ‘TR’ monogram laser cut in the cover. Theodore Roosevelt once said: “Every man owes a portion of his time & his income to the business or industry in which he earns a living”. This quote will be embossed in gold leaf on the makers label on the inside cover of the case. Factory letter from Turnbull Restoration & Manufacturing Co. with a description of work done to each gun. One piece ivory with carved "TR" monogram on right grip & carved buffalo on left grip.